There is something completely natural and unassuming about Mike Polizze’s approach to music. He’s recorded under the name Purling Hiss for the last several years, but recently recruited a band to perform live. Purling Hiss is all about no-nonsense guitar-centered hard rock. Polizze is from the Philadelphia school of long-haired guitar, which includes Kurt Vile and Adam Granduciel of The War On Drugs. The common characteristic (besides the hair) is that each of these artists is a fairly mellow and unassuming person off-stage who immediately crank the volume and the energy when the amps are turned on. 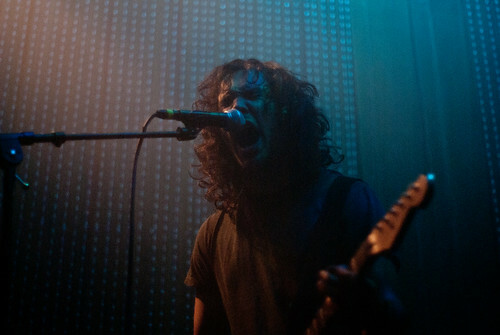 Last week at Cameo Gallery, we saw Purling Hiss for the first time since they opened for Vile at Bowery last June. This time, the band headlined and performed an outstanding forty-five minute set that never let up. Polizze’s guitar was front and center from the outset and each song provided an opportunity to stretch out and flex the axe. We’re streaming “Passenger Queen”, which switched to overdrive about halfway through the six minute song and provided one of the many Polizze peaks. I recorded this set with the Neumann’s raised on a pole eight feet high directly in front of the soundboard and mixed with a soundboard feed. The sound quality is superb. Enjoy! If you email nyctaper for access to this recording, we expect that you will PLEASE SUPPORT Purling Hiss, visit their Facebook page, and purchase Lounge Lizards from the Mexican Summer website [HERE], and their other releases from Woodsist Records [HERE]. North Highlands are one of Brooklyn’s most promising new indie-folk bands. Their 2010 Sugar Lips EP gave us a taste of their talent, as Brenda Malvini’s sweet vocals and keys are accompanied by a full band of accomplished musicians. In October, the band released their first full length album. Wild One is the full realization of those talents, as eleven-song album features infectious and expertly crafted melodies. At the Cameo Gallery on Saturday of CMJ week, North Highlands played in the middle of the bill but brought out a fine crowd for their 4 pm set time. The band’s short set featured five Wild One songs, and one apparent new song. We are streaming “Bruce” which features an irresistible hook that is spiced up with a nod to Springsteen’s “Dancing In The Dark”. North Highlands have two upcoming gigs, on November 17 at Shea Stadium and December 15 at Glasslands (PopGun Presents Holiday Party!). I recorded this set in the same manner as the previous posts from this show. The vocal microphone was problematic for the first two songs so that the lead vocal levels are low, but ultimately reach the appropriate volume. With that caveat, enjoy! If you enjoyed this recording from NYCTaper, PLEASE SUPPORT North Highlands, visit their Facebook Page, and purchase their new album Wild One from their Bandcamp page [HERE]. Prussia is a self-described “experimental pop” band from Detroit. With two keyboards, often three guitars, and a range of sound effects to supplement the unique vocals of singer Ryan Spencer, Prussia is at the forefront of the burgeoning Michigan underground music scene. Last week, the band traveled to NYC for CMJ and performed seven times. We were fortunate to have them play at both shows we hosted this year — the NYCTaper CMJ show at Cake Shop on Thursday and the Golden Ratio / BirdDog Promo / NYCTaper show at Cameo Gallery on Saturday. Prussia played in the second slot for both shows, but the early afternoon set time did not detract from their energy or musical prowess. Behind all of the inventive experimental indie is simply five outstanding musicians. Prussia’s third release is their new album Poor English, which is available in a “name your price” format on Bandcamp. Their set included four of the new songs, two of which are streaming below. I recorded the Cake Shop set in the same manner as all the of the recordings already posted from that day and the sound quality is superb. The Cameo Gallery recording is a mix of the Neumann microphones on a stand in front of the soundboard booth and mixed with a soundboard feed. The room is a boomier than Cake Shop, so that while the sound is quite excellent, its a very different recording from the Cake Shop one. Enjoy both! If you enjoyed this recording from NYCTaper, PLEASE SUPPORT Prussia, visit their website, and and purchase their new album Poor English from their Bandcamp page [HERE]. In the last six weeks, we have twice had the pleasure of seeing one of Brooklyn’s brightest new bands — each time supporting an nyctaper-favorite band. In August when Caveman opened for War On Drugs at Cameo Gallery, we were unfamiliar with the band. Their sound features prominent keyboards, which naturally draws comparison to 80s bands, but its the heavy rhythmic elements that align them with contemporaries like The Dodos and Local Natives. Following the Cameo show, Caveman played a sold-out CD release show for their debut album CoCo Beware at Mercury Lounge. We caught them again after the Mercury coming-out party, this time at the Beekman Beer Garden with The Hold Steady. Perhaps it was my imagination, but it seemed that in a month since the Cameo show, Caveman was playing tighter and with more confidence. “Old Friend”, which flows live from the instrumental “Vampirer” was a strong end of set number that features a driving beat and the sweet melancholy vocals of Matthew Iwanusa, and we are streaming it below. I recorded the Cameo show in the same manner at the War On Drugs recording, with the Neumanns supplemented with a mono board feed. The Beekman show was recorded with the four-microphone rig directly in front of the soundboard cage. The sound quality of both sets is excellent. Enjoy! 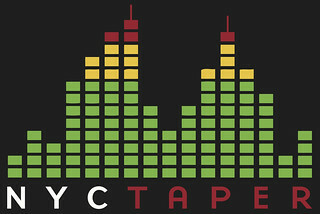 If you email nyctaper for access to this recording, we expect that you will PLEASE SUPPORT Caveman, visit their website, and purchase CoCo Beware directly from their website [HERE]. The first show in what promises to be a long-running charity series called Noncerts took place in the end of February at the Cameo Gallery. The main purpose of Noncerts is to purchase a piano for every public school in Brooklyn, and all proceeds from the events go towards that goal. The first night featured performances from Noncerts founder Dave Godowsky, superb songwriter David Dondero, Ween leader Gene Ween, and the lead singer of The Walkmen Hamilton Leithauser. Hamilton’s set threw us for a bit of a loop — but in a good way. Instead of solo Walkmen numbers, the entire Leithauser set consisted of fairly obscure but brilliant covers, which included nyctaper-favorite Cass McCombs (“Don’t Vote”), and DC political punk band Weird War (stream “See About Me” below) . We also recorded the second Noncerts show in the end of April, and hope to offer sets from that night soon. I recorded this set with the Neumanns mounted at the front of the sound booth and mixed with an excellent soundboard feed. The sound quality of this set is superb. Enjoy! Support Noncerts by following them on twitter [here]. 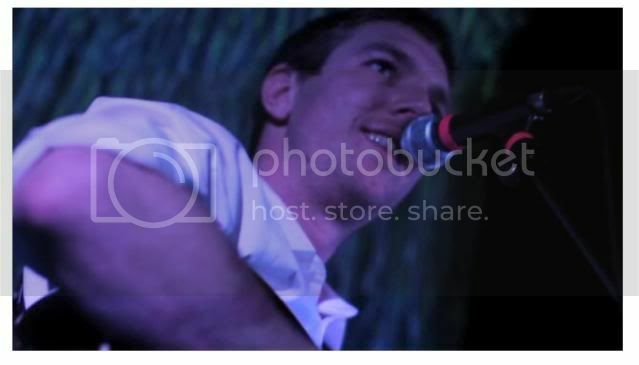 If you download this recording from NYCTaper, we expect that you will PLEASE SUPPORT Hamilton Leithauser and The Walkmen, visit their website, and purchase their official releases from the Fat Possum Records website [HERE].